The Senate attempted to override Governor Wolf’s veto of an emergency budget passed last month by the General Assembly. I recently joined state and local officials in honoring Corporal Bryon K. Dickson, II, the Pennsylvania State Trooper and Marine who was killed in the line of duty on Sept. 12, 2014. 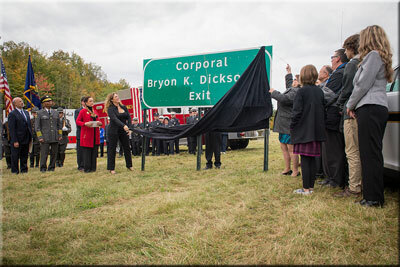 Together with his family, we unveiled a sign designating exit 30 on I-84 in his memory. The passage of time alone does not ease the pain of this public protector and defender of freedom being lost to us. Every time we pass this exit, this sign will be a reminder of the sacrifice of a true hero. To his family, friends, colleagues and admirers, this is an assurance that we will never forget a life defined by service and contribution. I have been named to a special, bipartisan panel to examine possible action against Attorney General Kathleen Kane, as a result of the suspension of her law license by the Disciplinary Board of the Pennsylvania Supreme Court. Chaired by Senator John Gordner (R-27), other members of the Special Committee on Senate Address include Senators Art Haywood (D-4), Judy Schwank (D-11), Senator Sean Wiley (D-49), and Senator Gene Yaw (R-23). The state Attorney General’s law license has been indefinitely suspended by the Disciplinary Board of the Pennsylvania Supreme Court. A little-used constitutional provision presents the possibility of the state Senate, by a two-thirds vote, recommending to the governor that the attorney general be removed from office. We need to determine if this power properly applies to the current situation, and if so, how due process is ensured should a vote for removal be warranted. This key question must be confronted: Does the loss of her law license preclude her from effectively functioning as the state’s chief law enforcement officer? 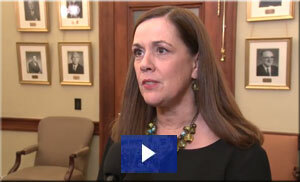 Complete details are available at http://senateaddress.pasen.gov/. Those wishing to submit information regarding the operations of the Office of Attorney General are encouraged to do so via email at senateaddress@pasen.gov. Pennsylvanians have an overriding interest in a review that is fair, thorough, responsible, and bipartisan. My participation on this special committee will be faithful to that public interest and expectation. The committee must issue a written report to the full Senate in 30 days. The Task Force on Lyme Disease and Related Tick-Borne Diseases has released its report providing 18 recommendations to the Department of Health and the General Assembly on prevention, education, and surveillance strategies to combat the growing incidence of Lyme and other tick-borne diseases in Pennsylvania. The report can be found here. We will be working to implement policy changes to combat this growing problem. Our fifth annual Luzerne County Senior Expo, held October 15 at the 109th Field Artillery Armory in Wilkes-Barre, was a success. Along with Sen. John Yudichak, the expo drew more than 100 vendors including businesses, non-profits and local, county and state agencies. Hundreds of visitors visited to discuss issues affecting them, get health screenings, enjoy refreshments and free flu shots. 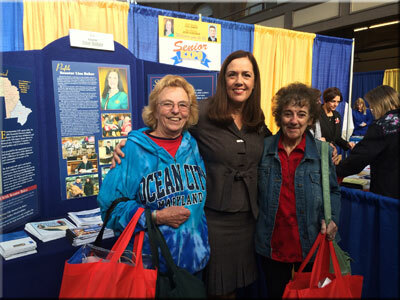 Senator Baker with some of the hundreds of attendees at the fifth annual Luzerne County Senior Expo. To see photos from the event, click here.